Milani is probably my favorite drug store cosmetic brand. I love their various shades of liquid liner, and their lip colors are to die for. 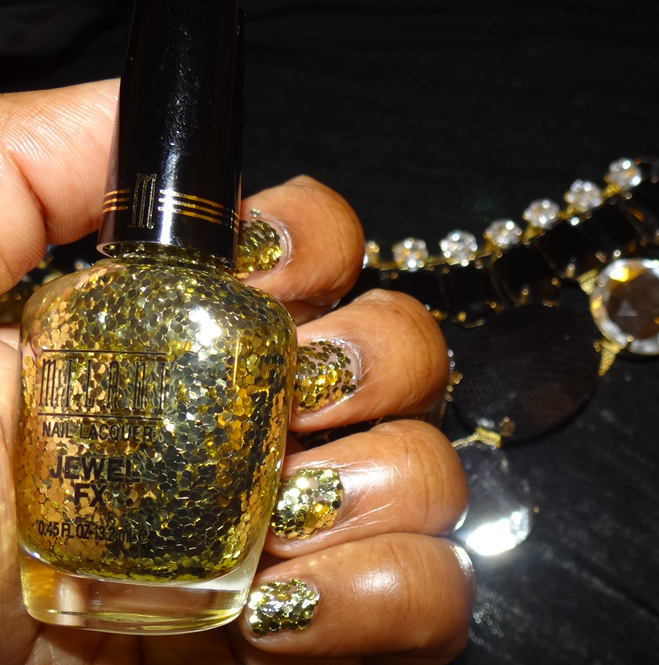 When I saw a bottle of glitter nail lacquer, all I could say was “O.M.G. !” It’s not fine glitter dust. This is like real deal glitter bits on your nails. I used this nail lacquer for the night of my birthday celebration and it didn’t make it to the morning. But in the amount of time the lacquer actually lasted on my nails, I felt super glamorous. I totally approve the 5 star glam look for those few short hours, but if you are looking for a lasting nail lacquer, this probably isn’t it. To be clear; however, I did layer on the lacquer to get that heavy jeweled effect, so the lighter the layer, the longer the wear.